The tower is modeled on the ancient Pryn-Gul tower which can be found in down town Gar Loren, capital of the Furbarnii Empire. For centuries the fabled Tuw-Fah bridge has connected the Pryn-Gul Tower to the barracks complex of the Furbarnii knights. 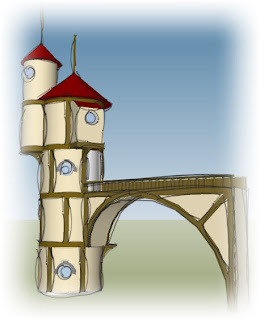 An artists impression of the Pryn-Gul Tower, showing the Tuw-Fah bridge. Recently discovered archive plans for the design of the bridge.